Submitted by Fbuscemi on Thu, 02/07/2009 - 16:34. 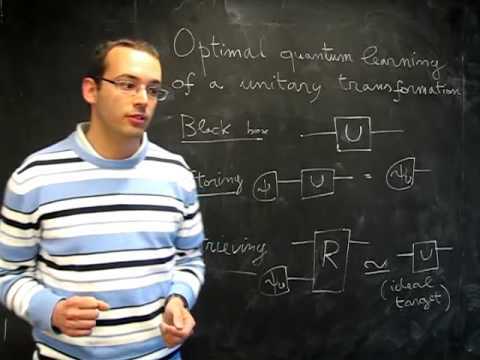 Quantum Information Theory is the study of information-processing tasks such as storage and transmission of information, or manipulation of entanglement, using quantum-mechanical systems. Until very recently, the study of these processes was limited to the case in which the required resources, e.g. information sources, communication channels or entanglement resources, were assumed to be available for an infinite number of independent uses. We prove that the optimal strategy to store an unknown group transformation into a quantum memory is to apply the available uses in parallel on a suitable entangled state. The optimal retrieving strategy is the incoherent, ``measure-and-rotate'' strategy, in which the quantum memory is measured and a unitary depending on the outcome is performed. The same result holds for approximate re-alignment of reference frames for quantum communication. Submitted by Burgarth on Wed, 01/07/2009 - 20:28. The National Quantum Information Centre of Gdansk (NQuantIC), together with the University of Gdansk is seeking an experimentalist interested in a position (professor or senior researcher) in experimental quantum optics and/or quantum information technology. Submitted by Marek.zukowski on Sun, 14/06/2009 - 11:19. Submitted by Perinotti on Tue, 26/05/2009 - 18:39. Applications are invited for a postdoctoral research associate position at Aberystwyth University. The successful candidate will work on an EPSRC funded project on theoretic methods applied to quantum control, and will work with the Quantum Open Systems and Control research group at Aberystwyth. Submitted by John.gough on Tue, 26/05/2009 - 12:58.